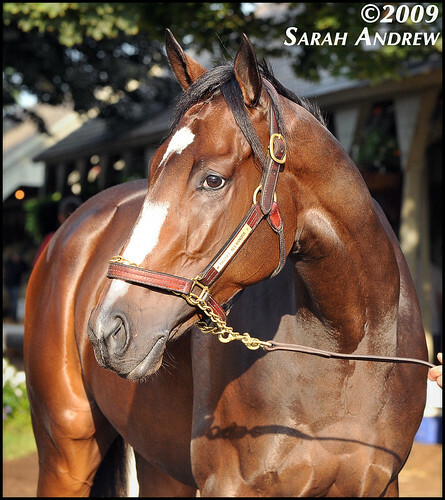 Rachel Alexandra to Woodward!, originally uploaded by Rock and Racehorses. With the news that Rachel Alexandra will indeed aim for the G1 Woodward Handicap against older males on September 5, questions have been raised regarding the historical importance of such an undertaking. As I wrote previously, no filly or mare has ever won the Woodward—the last filly to attempt it was 4-year-old Lady’s Secret who finished second to Precisionist in 1986—and only thirteen 3-year-olds have won the race in 55 years, the last being Holy Bull in 1994. The only 3-year-old filly to place in the Woodward was CCAO and Alabama winner Summer Guest who finished third behind Key to the Mint and Autobiography in 1972. Beyond the Woodward itself, when was the last time a 3-year-old filly ran against older males over a route distance on dirt in North America in a graded or its equivalent race—and been successful? In his excellent blog, Colin’s Ghost has already examined the two best examples—1944 Pimlico Special winner Twilight Tear, and 1945 Washington Park Handicap victress Busher. But, how many others are there? By examining the history of great handicap races, the results are quite remarkable. Only 4 mares have won the Metropolitan, all at the age of 4—Gunfire (1903), Black Maria (1927), Nimba (1928), and Gallorette (1946)—and the two most recent place getters, Honest Lady (second, 2000) and Lady’s Secret (third, 1986), were both 4-year-olds. Only sixteen 3-year-olds colts and geldings have won the Met Mile since 1891, the latest being Honour and Glory, in 1996. How have fillies fared? The great Beldame in 1904 ran third behind Irish Lad and Toboggan, while Casseopia finished third against Voter and The Winner in 1897. Reina (1902), Tokalon (1906), Gallorette (1946) and Conniver (1948) are the only mares to win the Brooklyn, although several have been runners-up: Gunfire (1903), Regret (1917), Good Gamble (1936), Gallorette (1948) and, most recently, Life’s Magic (1985). While thirteen 3-year-old colts/geldings have won, the last being Any Given Saturday in 2007, the only 3-year-old filly place-getter was Fleam, who finished third behind Discovery and Dark Secret in 1934. Five mares have won the Suburban—Imp (1899), Beldame (1905), Bateau (1929), Harmonica (1948) and Busanda (1951)—and none were 3-year-olds. In fact, no 3-year-old filly has placed in this race, and, since first being run in 1884, only seven 3-year-old colts and geldings have won, the last being Buffle in 1966. Six mares have won the Whitney, beginning with Black Maria who won the inaugural race in 1928, followed by Bateau (1929), Esposa (1937), Gallorette (1948), Lady’s Secret (1986) and Personal Ensign (1988)—none were 3-year-olds. However, Esposa did finish second at age 3 in 1935 behind Discovery, and then repeated that performance in 1936 before winning as a 5-year-old—and then finished second, at age 6, to the Triple Crown victor War Admiral. In all, twelve 3-year-old colts/geldings have won, the last being Easy Goer in 1989. In 1996, 4-year-old Serena’s Song finished second, a neck behind Mahogany Hall, runner-up in both the Suburban and Brooklyn handicaps. The only mare to win the JCGC is the great Shuvee who won back-to-back editions in 1970 and 1971. Three-year-olds have done well in this race, though, with 34 winners since 1919, including Curlin in 2007. The first 3-year-old filly to place was a daughter of Man O’War, Judy O’Grady who finished second behind Firethorn in 1935. Her daughter Irish Nora produced, by Triple Crown winner Count Fleet, Kiss Me Kate who finished third behind eventual Horse of the Year Counterpoint and reigning Horse of the Year Hill Prince on route to winning champion 3-year-old filly honors in 1951. In 1976, Coaching Club American Oaks victress Revidere finished third behind Great Contractor, while in 1982, champion filly Christmas Past fleshed out the trifecta behind two 4-year-old warriors, Lemhi Gold and Silver Surprise. Now run on turf, prior to 1970 this was a dirt race, albeit contested over various distances. In those years when it was at least 8 furlongs and run on dirt, filly/mare winners include the only 3-year-old filly winner Lady Primrose (1887), in addition to older mares Firenze (1888), Los Angeles (1889), and Harem Lady (1969). Other 3-year-old fillies that ran successfully in the Manhattan: Jacoba finished third behind Belmont winner The Finn in 1916; Kentucky Oaks winner Untidy ran second to Little Chief in 1923; Princess Tina was runner-up to Preakness winner Victorian in 1928; and 1935 JCGC runner-up Judy O’Grady repeated that performance, this time behind Count Arthur. First run in 1902, the second winner of this race was a 3-year-filly named Wild Thyme. The brilliant Black Maria won back-to-back editions, at age 3 in 1926 and 4 in 1927. Other 3-year-old filly winners are Black Mammy (1930), Coequel (1934), and Good Gamble (1935), while Alabama victress Maskette (1909) finished second to Firestone during her 3-year-old campaign. Sixteen 3-year-old colts/geldings have won over the years, but the last was Damascus in 1967—the same year that 5-year-old mare Straight Deal finished third. In 1947, the mares Gallorette and Elpis finished second and third respectively, behind the great Stymie. One quirk: the colt Cannonade won the race at age 2. A recently-defunct race (or so it appears), this race has an impressive list of winners: Armed, Swaps, Coaltown, Round Table, Majestic Light and Spectacular Bid. When run on dirt, at a distance of at least 8 furlongs, there have been, in addition to 3-year-old victress Busher (1945), several mare winners: Late Date (1935), War Plumage (1940), Sickles Image (1953) and Pucker Up (1957). In 1949, 3-year-old Lithe, daughter of champion filly Alcibiades, ran third behind Coaltown and Armed. No filly or mare has even won the Big ‘Cap, although a couple have come close, including runners-up Next Move (1951), Gamely (1969) and Island Fashion (2004)—none were 3-year-olds. From its inception in 1935 until 1969, it was open to 3-year-olds, but no longer, and only one 3-year-old has ever won this race, colt Stagehand (1938). Three older mares have won the Gold Cup—Happy Issue (1944), Two Lea (1952), and Princessnesian (1968). Only three 3-year-old colts/geldings have won this race—Round Table (1957), Quack (1972), and Island Whirl (1983)—but in 1946, the 3-year-old filly Honeymoon finished second behind Triplicate. The two other mare runner-ups are Bewitch, who finished behind Citation in 1951, and Cascapedia in 1977. Honeymoon (1947), A Gleam (1953) and Manta (1971) were older when they finished third. Defunct between 1959 and 1987, this race was first won in 1937 by War Admiral, and counts among its victors Seabiscuit, Whirlaway, Armed, Assault, Citation and Tom Fool. The 3-year-old filly Twilight Tear’s victory over Devil Diver in 1944 marks the only time a filly or mare has won, but champion 3-year-old filly Bridal Flower finished third behind subsequent Horse of the Year Assault and Stymie in 1946—she had previously defeated Assault in the Roamer Handicap. Despite its spotty recent history, the Mass Cap has long drawn top handicap horses—but it’s never been won by a filly or mare. Three mares have been runners-up, namely CCAO winner Elpis (1947), Suburban victress Harmonica (1948), and Canadian International champion Drumtop (1970). Gallorette (1946) once finished third, but perhaps the most notorious place finisher was 4-year-old mare Fair Knightess, workmate of the great Seabiscuit, who ran third to him in 1937 edition. Only four 3-year-old colts/geldings have won; no placings by 3-year-old fillies. Sporadic history with this race, first run in 1958 and for the last time in 1993, but three mare winners: Old Hat (1965), My Juliet (1977), and Glorious Song (1980). Named Canadian Horse of the Year in 1980, Glorious Song was a wonderful broodmare, producing exemplary sires Rahy and Singspiel. My Juliet produced, among others, multiple-G1 victress Stella Madrid and G1 Shuvee winner Tis Juliet. Notice, the most recent two winners. Fairway Flyer, third-place finisher in the Kentucky Oaks behind the outstanding Susan’s Girl, and eventual 3-year-old champion filly Surfside—daughter of Triple Crown champion Seattle Slew, out of the Eclipse-winning mare Flanders—who defeated a field that included Aptitude and Guided Tour. When Surfside won the Clark, it was a G2; the graded system did not exist when Fairway Flyer won. The only other 3-year-old filly that has even placed in the Clark is Ashland Oaks winner Anna M. Humphrey who finished second behind the great 7-year-old Audacious in 1923. Other notable recent placings in important handicaps include 4-year-old filly Glorious Song’s second place effort behind Winter’s Tale in the 1980 Marlboro Cup Handicap; 5-year-old Heavenly Prize’s third place finish behind Cigar in the 1996 G1 Donn Handicap; and, of course, 5-year-old Life is Sweet’s third place finish in the G1 Hollywood Gold Cup this year. So, what does it all mean? While fillies and mares have had some success in open company against older males on dirt, they are relatively few in numbers—but extraordinary in talent. Additionally, most were well-seasoned campaigners, age 4 and above. Whether through misfortunate injuries or simply bad historical timing, none of these great mares were able to accomplish what Rachel Alexandra may do on September 5—win a G1 dirt route vs. older males as a 3-year-old. That’s pretty incredible. Sid Fernando reminded me that, in 1983, 4-year-old mare Christmas Past won the G1 Gulfstream Park Handicap, so I went back into this race to find that 6-year-old mare Rampart defeated the great Armed in the third running of this race, back in 1948. The only other mare place-getter in the history of this race is 5-year-old Intencion, back in 1954. Christmas Past won the G1 Gulfstream Park H at 4, in 1983, too, defeating colts. Thanks, Sid! I don't why I had it in my head that the GP H. was on turf. I'd add this example to the main body of the post. I'm so excited to have found your blog! Thank you! And when these 3-year-old fillies won, these races were either not graded (before the grading system began) or were G2's, in Surfside's case. So, as you stated, Rachel Alexandra would be the first 3-year-old filly to win a G1 race on dirt vs. older males. Excellent job. Thanks for sharing the information. Ruffianruns, that about sums it up, except for these examples are all route races (1 mile or beyond), so I didn't take into consideration female sprinters who have traditionally done well, and I didn't look at turf races for basically the same reasons. So what Rachel is attempting really is quite extraordinary. Miss Woodford won twice at 3 vs. older males in route stakes back in 1883, and the great Beldame won 4 times vs. older males at 3, including the Carter H. in her very first start of the year.